Subscription billing features that "just work"
SubscriptionBridge contains lots of administration tools (the "Merchant Center") that make it quick and easy to create new subscription packages (subscription-based products and services), and manage existing subscriptions. Set up one or more stores. Set up products, plans, and features. Combine them in all kinds of subscription packages. Easily assign optional features to multiple packages. Coming soon: full support for multiple languages. Easily locate a subscription by searching on a variety of filters (e.g. name, company, e-mail, etc.). Add or remove features to/from an existing subscription, and automatically notify the customer. Upgrade or downgrade, if related subscription packages exist. Automatically calculate a pro-rated balance (e.g. new features added, price is higher now), then notify the customer. Add one-time charges for products/services related to the subscription, but not affecting the recurring amount. SubscriptionBridge includes a ready-to-go, hosted shopping cart that allow you to immediately start selling any subscription packages you create in the SubscriptionBridge Merchant Center. The hosted checkout pages provide a secure, PCI-compliant environment. 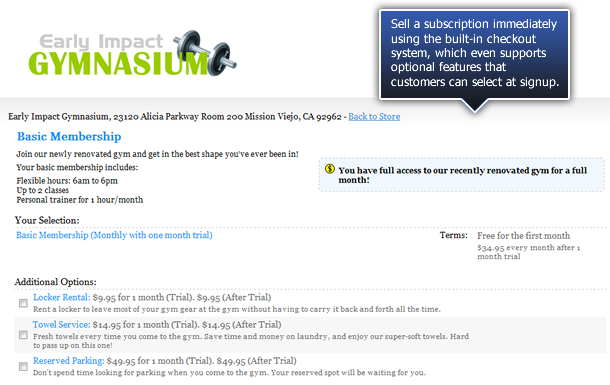 Display of subscription name, description, terms & conditions, etc. PCI compliant: learn more about SubscriptionBridge and PCI compliance. By leveraging the SubscriptionBridge API, you can trigger the creation of a subscription profile from within your own application. 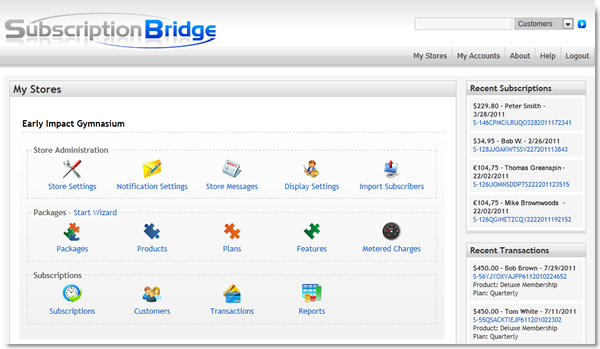 The SubscriptionBridge Customer Center is a hosted, readily available, branded customer service area for self-service subscription management. By allowing subscribers (your customers) to easily view and manage their subscriptions, SubscriptionBridge can help you dramatically lower customer service costs. The system will help you eliminate tedious and time consuming tasks such as assisting customers with changing their payment method. It will also improve customer satisfaction as customers will be able to perform those tasks quickly, whenever they need to do so, without having to contact you. By leveraging the SubscriptionBridge API, there are many customer service tasks that can be performed from an external application. Automatically send nicely formatted, HTML e-mail notifications (which include your logo). Add custom messages to most of the notifications. Specify when to follow-up after a failed payment (e.g. follow up 3 times). Manually notify a customer (e.g. to remind about an outstanding balance). Advanced users: specify a Callback URL and react to events from a custom application. Add usage-based fees to a subscription to support more flexible business models. Often called metered charges, they are typically based on one or more variables that you are monitoring and measuring to determine the charge (e.g. disk space or bandwidth used for a Web hosting account, mobile phone minutes or text messages sent, number of transactions processed, etc. etc.). 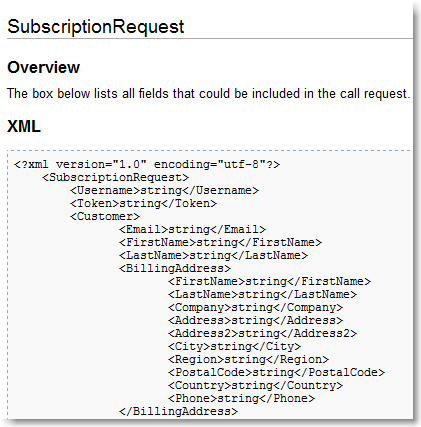 Add usage-based fees manually through the SubscriptionBridge Merchant Center or dynamically through the API. Add multiple metered charges to the same subscription, for the same billing period (e.g. you are metering multiple variables, such as minutes and text messages on the same phone plan). Feature Limitation: usage-based billing requires that the Braintree is used as the payment system. For technical reasons, at this point this feature is not compatible with Authorize.Net ARB. ... but managed in one location, under one account (save time and money!). From the same SubscriptionBridge Merchant Center you can create multiple stores. Each store is a separate business, with separate products, subscriptions, reports, notification settings, etc. For example, if you have two different online magazines, you can manage them as two separate businesses in SubscriptionBridge, at no extra cost (you are simply charged based on the total number of active subscribers. And your customers will be able to use a single account to manage subscriptions across different businesses. 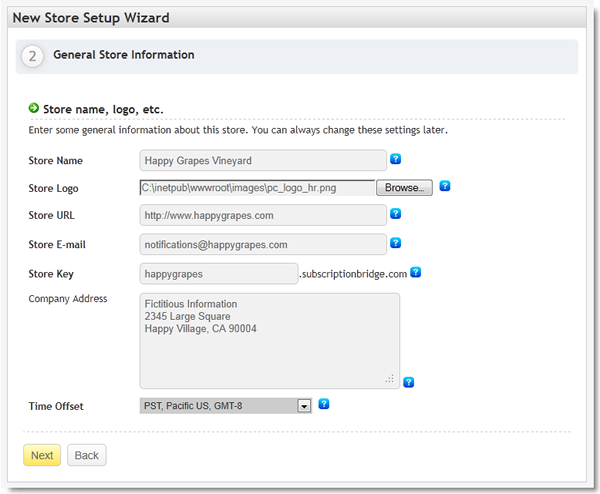 The Store Setup Wizard makes it quick and easy to setup a new business in the SB Merchant Center. Unlike some providers that charge based on predetermined packages, SubscriptionBridge's common-sense pricing is based on a simple rule: you pay for what you use. Among other advantages, this approach allows you to very easily account for the cost of using SubscriptionBridge in your business model. You can run multiple businesses through the same account (e.g. two separate "Wine Clubs"). Learn more about our clear, transparent, fair subscription management pricing. If you need to sell both subscription and non-subscription products or services, what you need is a subscription billing system that is integrated with a robust shopping cart program. This allows you to pick certain products and services in your ecommerce store catalog, "flag" them as subscriptions, and set up the subscription profile when an order is placed. Specify whether customers need to agree to product/service-specific "Terms & Conditions"
Use the Import Subscription Wizard to load into SubscriptionBridge subscription profiles that already exist in one of our supported payment system (e.g. existing Authorize.Net ARB recurring payment profiles). Our staff will work with you to ensure a smooth transition into SubscriptionBridge. Visit the SubscriptionBridge WIKI for full API documentation. Both the SubscriptionBridge system itself and our payment partners are PCI compliance applications, which reduces the scope of your PCI compliance efforts (e.g. you may be able to use the much easier, short-form self assessment questionnaire). SubscriptionBridge is hosted in a secure, redundant hosting environmet at RackSpace, one of the world leaders in professional hosting services. SubscriptionBridge is a PCI-DSS validated application. The payment systems it uses are all PCI compliant. More on SubscriptionBridge and PCI compliance. Are you using Authorize.Net Automated Recurring Billing for your recurring payments? Would you like more control on managing those subscriptions, from the emails that are sent to the handling of declined payments? SubscriptionBridge gives you the ability to add smart subscription management features to Authorize.Net ARB, while helping reduce customer service costs. More on subscription management for Authorize.Net Automated Recurring Billing. Add a complete set of recurring billing and subscription management features to the popular Braintree payment gateway. SubscriptionBridge acts as the recurring payment engine, for additional flexibility. More on subscription management with Braintree.